In their second edition of Combating Corruption, Encouraging Ethics, ASPA members William L. Richter and Frances Burke update this essential staple to delve deeply into the unique ethical problems of twenty-first century public administration. Public Administration Review is published every other month, 6 issues per year. International subscriptions are available at $75 per year international air delivery. Subscriptions must be prepaid, U.S. dollars or credit card. Domestic subscriptions are available at $50 per year first class delivery. Subscriptions must be prepaid, U.S. dollars or credit card. This is a signed copy of Gov. Wilder's book. A pocket-sized book featuring quotes reflecting on the various facets of public service: public service motivation, compassion, purpose, ethics, citizenship and more. Compiled by Marc Holzer, Distinguished Professor, Suffolk University. 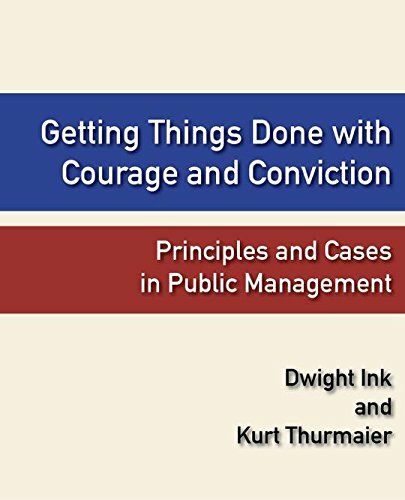 The cases in Getting Things Done with Courage and Conviction are extracted from the experiences of Dwight Ink, whose career has spanned more than 50 years (and counting...), including key roles in helping advance important initiatives of seven presidents. Each of the nine cases provides insights into key government operations that are relevant to public administrators today. (c) 2005, A collection of George Frederickson's columns from PA TIMES. Performance Measurement Concepts & Techniques 3rd Ed. This workbook will help you understand and implement performance measurement. It is designed for use in workshops, department/agency performance improvement efforts, and MPA programs, and is published by the American Society for Public Administration's (ASPA) Center for Accountability and Performance (CAP).